This is a favorite quick-meal at our house. You can finish this dish in the time it takes to boil a pot of water and cook your pasta. The garlic-cream sauce is also much better than the jarred “alfredo” sauce you find in store (abominations, IMO), and the milanese technique can be applied to other meats. This will feed four hungry people, but can easily be scaled up or down. Put a big pot of salty water on to boil. Use a heavy pan to pound flat 2 chicken breasts, until they are about 1/2 inch thick. Rub the chicken breasts with salt and the zest of 2 lemons (this can be done a few hours ahead of time, or over night for added flavor). Let the chicken sit during the next few steps. Put 1 cup heavy cream and 1/4 cup milk into a sauce pan, along with 4-6 large cloves garlic, and put over very low heat to simmer. Depending on how garlicky you want your sauce, either mince the garlic to be left in the sauce, or chop it into large piece to be fished out later. Beat 1 egg in a contain that you can dunk the chicken in (I used a big bowl, but a big plate or baking dish will work). Get a bowl/baking dish and add 1-2 Panko bread crumbs and a big pinch of salt. Dunk the chicken breasts in the egg wash, let the extra egg fall off, then dredge the chicken in the bread crumbs, coating evenly and thoroughly. When your water is boiling, add 1 pound linguini. Heat a large skillet with a few tbsp of oil in it. You might need two skillets depending on the size of your chicken. Cook the chicken in the hot oil for a few minutes on each side, until the breadcrumbs are nicely browned. The chicken cooks much quicker because it is thinner. 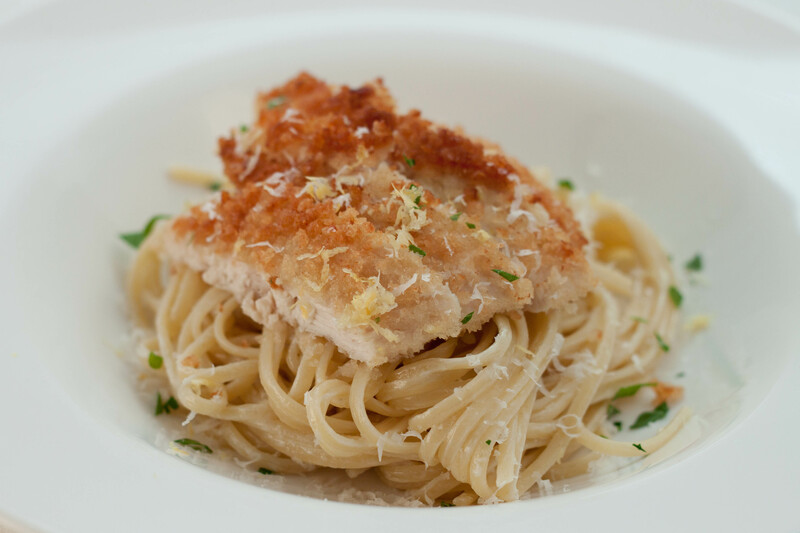 Remove the cooked chicken to a cutting board, and allow it to cool while you’re draining the pasta. If desired, fish out the garlic from your sauce. Add 2 cups grated Parmesan cheese (1 cup if it’s the grated stuff in a jar) and stir. Season with a little pepper, and salt if necessary (probably not). To serve, stir the sauce into the pasta and plate. Slice the chicken breasts and add to the pasta. Sprinkle 1-2 Tbsp chopped parsley on top, and any remaining lemon zest. Enjoy!